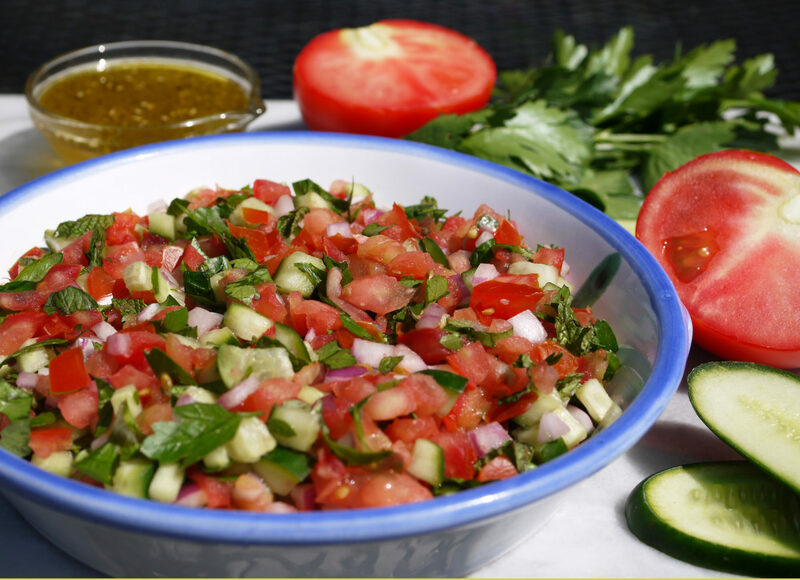 Light up your Shabbat table or your succah with a bright, fresh and healthy Israeli Salad. We have added za’atar to the recipe to add a little extra flavor. You can serve this as a simple appetizer or side dish but we also love to prepare little Pita pockets with a handful of salad, Kafta and Tahini Sauce. This is a perfect dish for your Shabbat luncheon or Succot celebration. Looks great, but what is za’atar? Za’atar is spice blend combining toasted sesame seeds, dried thyme, dried marjoram, and sumac. Combine: dried thyme, 1 Tbs. lightly toasted sesame seeds, 1 Tbs. ground sumac, 1/2 tsp. dried oregano or marjoram, and 1/4 tsp. kosher salt in a spice grinder. It is not a special Salad. It is a simple Salad. We make delicious Salad more than that. Where do you find sumac ? Is this actually from the tree? Sumac is made from the ground berries of the Sumac bush native to the Middle East. You can buy it at speciality food stores and it’s also available through Amazon. Za’atar is a spice blend of toasted sesame seeds, dried thyme, dried marjoram, and sumac.